It was a cold rainy Saturday morning. December 1983. My first time to Europe, to Paris, to Notre Dame. I walked through the west doors under the famous sculpture-covered arches and was stunned to silence. The vaulted ceiling curved high overhead, the arcades along sides spread into candlelit gloom, the central aisle stretched away in front of me. It was immense. Quiet. Awe-inspiring. Then I got to the “crossing” where the arms of the church meet… and stopped dead, speechless. 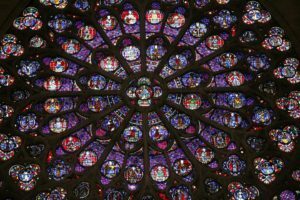 For at the end of the transepts on either side of us glowed the huge rose windows in all their red and blue glory. I thought of the all devotion, the artistry, the skill which created this wondrous sight, all the history this place had seen and survived. I was moved to tears. I’ve been to Paris many times since then and gone to Notre Dame every time. It became my place to go on that first afternoon when I was too jet-lagged to go anywhere unfamiliar, a special spot to simply sit and absorb the ageless beauty. So, like the rest of the world, I was shocked and horrified to see it burning last Monday. Someone said it was “like a punch to the gut.” Yes, that was the feeling. I could hardly believe something that had survived so much for so long might not survive me. 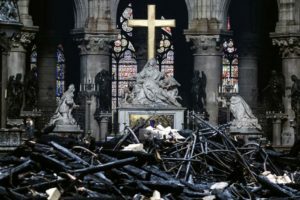 Despite the inferno which consumed the 12th century “forest” of trusses and beams under the roof, the flames shooting hundreds of feet in the air, the collapse of the spire at the very top of the cathedral, Tuesday morning revealed the cathedral, though deeply wounded, was not destroyed. The ancient walls still stand. Most of the relics and treasures were rescued. Even the rose windows I so cherish survived—something I think is pretty close to a miracle. But that wasn’t all that survived. In scrolling through the photos posted after the fire, I came across this one. I noticed something a sharp-eyed commentator on the evening news also did. What do you see first? What stands out to you beyond the gloomy scene, the heap of blackened rubble? The cross. The golden cross behind the altar glows brightly as ever. What a message for Holy Week! No matter how dark things look in the world or in my own life, God is still in control. And He has the victory. Christ is risen, indeed. Hallelujah! It was a long, tough winter. Record-breaking, as it turned out. 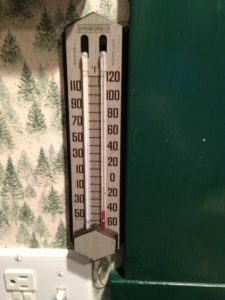 January was mild enough but the worst was to come. That morning, we were the third coldest place on the planet! As we all huddled inside and tried our best to endure, a bronchial-respiratory bug began making the rounds. I wasn’t as sick as I’ve been in recent winters, but I was sick enough to go to the doctor. The cough lingered on, along with general weakness and shortness of breath. Then the constant coughing kicked up pain in my back. For the first time since I learned to ski, I experienced all the misery of winter with none of the fun. At first, it was far too snowy and cold to try skiing. 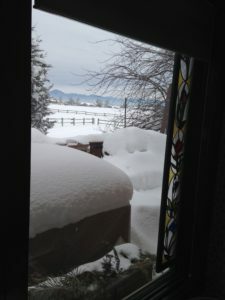 Then, I was too sick and weak to plow through the feet of accumulated snow. I stared out the window and sighed. Then I worried about a granddaughter who was diagnosed with a rare and painful bone condition after weeks of testing…and her family, trying to move to a new house in the midst of it all. And another old friend who I’d shared many a ski trail with died suddenly. Even small doses of the daily news made me want to shut my ears and scream. Restricted by my newly-discovered milk and egg allergies, I couldn’t even turn to the foods which had been my comfort since childhood. I staggered into Bible study that Tuesday afternoon in mid-March, struggling to find joy anywhere, my faith weighed down by one trial after another. Until discussion with my colleagues lead me to the Book of James. “Consider it pure joy, my brothers, whenever you face trials of many kinds,” we read. Really? Joy? Radio teacher Charles Swindoll once said the Greek word translated as “perseverance” means to “hold up under,” picturing a little donkey grunting under a big load. Since we had owned and loaded donkeys for many years, the illustration stuck. So I shared it. And we laughed together. Somehow my load felt lighter. I remembered why enduring it mattered. I knew my fellow Christians understood and were cheering me on. Their encouragement was enough to keep me going. In my life-long journey of faith, how many times has the church been there for me like that, doing what it just did? How often have fellow-believers made a huge difference in my faith? More than I can count. Now the church isn’t perfect; no group of imperfect people is. I had a faith-affirming experience last week. On our way to Salt Lake City, we listened to “The Case for a Creator” by Lee Strobel. I was blown away. Now you have to understand that, though I live in a family of scientists, I’m not one. I took what little I learned in high school 60 years ago, boxed it up and tossed it in the far corner of my mind, telling myself science was “not my thing.” I now realize I was afraid that learning more would destroy my faith. For now, as Strobel shows in many interviews with highly respected scientists in different areas of study, the cutting edge of scientific research is pointing toward God, not away from Him. They now believe there was, indeed, a moment, nick-named “the Big Bang,” when the universe was created. What’s more, the incredible complexity of the universe in general, the fine-tuning of the parameters of life in particular, leads them to the conclusion of an Intelligent Creator. Just the small glimpse these scientists give of His wonder leaves me gasping and groping for words. How can such an Awesome Being notice me at all, let alone love me? Why did He do this? Why would this amazing God humble Himself enough to take on the problems and limitations of human life? To be born as a helpless baby? To grow up subject to the care and instruction of fallible human parents, to become tired and thirsty and hungry? Even, as John Eldredge points out, to walk everywhere? Why should God allow Himself to be betrayed and rejected, to suffer on the cross, taking on the full forces of evil, sin and darkness? For love. For love so amazing it should drop us to our knees in awe. LORD JESUS: When I doubt Your love, remind me Who You are. Point me to the Cross. Amen. To be published in “Bozeman Daily Chronicle,” April 7, 2019. No sooner had I finished reading those words than an image leaped into my mind. Eighth grade. Honor society assembly. A group of teachers and students sat proudly on the stage, watching people walking around the rest of us, tapping out the ones selected to join. It was the worst moment of the worst time of my life. But those common junior high traumas were not all I suffered. I carried a dark secret in that “Father Knows Best” era: my family life was in chaos. My father was at the peak of his alcoholic addiction—a problem which made him range and rant around the house all night, while my mother tried in vain to calm him down. I cowered under the covers, frightened and helpless, wondering what was wrong with us, thinking we were the only ones who lived that way. I was deeply ashamed, terrified someone would find out. Then my beloved grandmother, who was my anchor in the storm, died. But at least, I had the classroom. There, I was the star. I might have been picked last when the recess softball teams were chosen, but everyone wanted me when it was time for spelling. My hand was always in the air, as I cried, “Teacher! Teacher!” shouting out the answer when she didn’t call on me. My report cards boasted all A’s. Always. Now, even that had been taken from me. I could hardly believe it. Why didn’t I make it? What hadn’t I done? What had I done wrong? I was never told. Sixty-four years later, I still feel the pain. Looking at the logo right now makes me cringe. Writer John Eldredge speaks of “arrows to the heart”—wounds that go to the very center of our being, destroying our confidence, our trust, our understanding of who we are. That’s what this awful moment was to me. The One Who knows us better and more deeply than any one else loves us, now and forever. He promises never, ever to fail or forsake us. (See Hebrews 13:5) He has chosen us—yes, you, yes, me–to belong to His eternal Honor Society: the only one which matters. Selah. Pause and let that amazing truth sink in. Last Sunday, our church celebrated the fulfillment of this amazing promise…and we didn’t even plan it. As the service began, our pastor’s wife, who is also the choir director, prefaced their anthem by reminding us that it’s five years since our pastor was at death’s door. He had gone to Minneapolis for surgery—a tricky procedure, but one we weren’t terribly worried about. Tricky procedures are almost commonplace these days. Sadly, this one went awry, leaving our pastor in a coma which lasted nine long days, while we wondered if he would wake up at all, or what he would be like when he did. His family kept vigil at his side while we waited for the email updates and fell on our faces in prayer. How well I remember the day we learned he had opened his eyes, when he talked, when they got him up walking for the first time. It felt like a miracle. For it was a dark time for our congregation, too. Our former pastor had just retired and moved to Choteau to care for his elderly mother. This man was scheduled to take over. Whatever would we do now? We felt helpless–like sheep without a shepherd. But we were not. God did not fail us or leave us without support. He provided some great pastors to fill in—including one who went on to be our pastor’s fulltime associate. The church pulled together and became closer than we ever had been. Now, five years later, our pastor stands before us—preaching, teaching, leading as he was called to do. He has even been strong to manage on his own for months at a time. Now, we all rejoice that we have just called a new young pastor, enthusiastic and full of energy, to share the load. Our pastor has lived to minister among us, celebrate his childrens’ weddings, welcome four grandchildren into the world—including the latest, born just this week. And she was delivered by my own daughter-in-law! FATHER GOD: You are faithful. You do, indeed, keep Your promises! You will, indeed, never fail or forsake us. We are, indeed, grateful. What a wonder…and a joy. Amen. To be published in “Bozeman Daily Chronicle,” February 24, 2019. Designed by Nancy Macrina. Copyright 2017. All rights reserved.